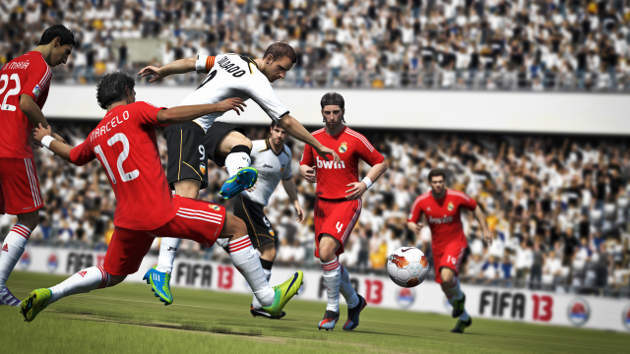 EA Sports have released another FIFA Soccer title, its twentieth FIFA Soccer title to be precise. You would have thought that the series might be on its last legs. There aren’t many other game series that could boast twenty titles as well as promise to keep it fresh every year. Well, somehow, EA Sports have done it again. 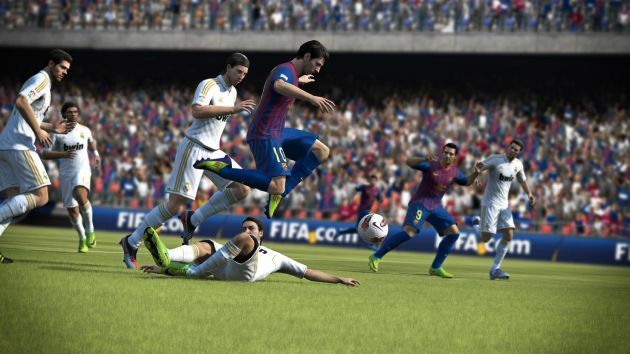 They’ve improved on some minor snagging flaws from last year’s FIFA 12, they’ve bought back some fan favourites and they’ve even added some new and innovative game modes. One of the most impressive aspects of the FIFA series has been its realism. It always tries to seem as realistic as possible and FIFA 13 is the most realistic football game yet. So realistic in fact that a friend spotted me in front of the telly and asked if I was playing FIFA 13. I replied, “No, I’m just watching football”. How can a game seem so realistic you might ask? Well it’s all thanks to some of the big changes to this years FIFA title. FIFA 12 was a brilliant game but the players always seemed to be a little too good. They could cut the balls out of the air with the slightest of touches and create acres of space with a mere step-over. True it was fun to play, but it wasn’t realistic football. FIFA 13 feels like real football. Players now take heavy touches, make poor dribbles and passes and smash the ball over the bar from five yards out. These are the most human computer generated players I’ve ever controlled. Everyone makes mistakes and thanks to EA’s new first touch mechanics, so can simulated people. Their first touch mechanic gives the game more depth. Players now have to pay close attention to their positioning, how heavy they’re holding the analogue sticks and how close the opposition defenders are before the ball even reaches them. A good touch is now the difference between silky one-touch Barcelona-style football and a lad’s kick about over their local park. But it’s not just the first touch that has made this FIFA so realistic. There are other small changes that seem minor by themselves, but together create something very special. For instance your computer controlled team mates now act like actual football players. The new attacking intelligence allows them to make inspiring runs creating space for you or a pass to channel the ball through. They pay attention to offside traps and the positioning of other defenders or attackers. It’s one of the first times that I’ve played a FIFA game and the computer has actually guessed my next move before I’ve even made it. Your team mates now enable you to play beautiful football rather than disable you from attacking creatively. When you’re actually on the ball the new Complete Dribbling tool means that you’ll now have full control over play. They are able to move the ball around in a 360 degree as well as switch between feet. This allows for a more creative playing style as well as a greater level of control for holding up play and making space for yourself and others. Creativity is a real theme running through FIFA 13. For the first time players are able to customize their free kicks like the pros. You have the ability to pick one or two other players to make dummy runs or short passes for the ultimate stylish free kick. It’s not just attacking that’s had a face-lift. Defending has also become more realistic, though less simple. Your defenders now track the runs of the opposing attackers as well as make their own runs into space when you have regained possession. We’ve even been given the opportunity to cheat whilst playing FIFA. When defending a free kick, players are able to edge the wall forward–but don’t get caught because you might get booked. Mistimed challenges are a real threat, especially with the improved player impact engine. Referees seem to make some really strange calls still. Even a brilliant clean tackle may be flagged up as a two footed shin breaker causing unfair red cards galore. Virtual refs still haven’t quite got the hang of the offside rule or the concept of the advantage. Perhaps this was intentional. Football is well known for its controversial refereeing decisions. Though I’d rather it wasn’t, so perhaps that’s something to sort out in FIFA ‘14. 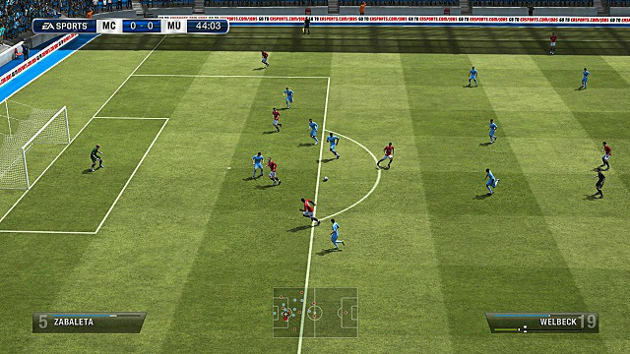 The biggest new addition to FIFA ’13 can be found with the introduction of Skill Games. These short, score-based games help players get to grips with the improved player impact engine, attacking intelligence and first touch mechanics in a fun and rewarding way. The challenges range from bronze to gold with the opportunity to test all that you have learnt in a final grand skill game (which is not for the faint of heart). This is a really exciting new addition as it’s not only a great way of honing your FIFA skills but a brilliant time killer when waiting for your game to start. Other game modes have had some slight changes. Career Mode now has two options; Player or Manager Mode. This means that players can no longer be a Player Manager, which is a shame but an understandable change. In the modern game player managers don’t really exist and for FIFA ’13 to complete its final transition into realism these sorts of options had to bite the bullet. Online modes such as Pro-Clubs and FIFA Ultimate Team have made a return and look better than ever. In Pro-Clubs, EA have ensured that online pros and offline pros remain separate to stop any foul play when it comes to hacking the stats of your player. They have also introduced FIFA Seasons to both Pro-Clubs and FIFA Ultimate Team making it more competitive but, in the long run, more rewarding. All of these game modes bring the potential for players to earn FIFA Points. These can be exchanged at the online store in return for classic kits, improvements to your pro, new boots, new celebrations; the list goes on. Overall these additions and tweaks have made FIFA 13 by far the best instalment of the series and the best football simulation game this year. There are so many little changes to this game since the last instalment that it’s hard to keep track of them all, or even notice. But I believe that’s the mark of a brilliant game and a lasting franchise. EA manage to maintain the values that fans love whilst at the same time keeping the game fresh and exciting. I’m sure that in a year’s time I’ll be just as excited to play FIFA 14 but still slightly disappointed that my ride with FIFA 13 will be drawing to an end.